We are only a few months into 2019 and it has already been a newsworthy year full of major headlines. With all of the dramatic changes and strong stances taking place in the current American social and political climate, pastors are feeling the effects of trying to lead God’s flock in a divided culture. In an article sharing some results of a new multi-year study by Barna, researchers examined how pastors are coming to terms with the expectations surrounding them in this divisive environment — expectations from themselves, their congregations, and the world outside the church. Titled “Faith Leadership in a Divided Culture,” the full report is “the culmination of four years of research examining clergy members’ views on matters of religious liberty in the United States,” according to the Barna website. “The statistics and data-based analyses in this study are derived from a series of national public opinion surveys conducted by Barna Group, among 1,608 clergy in the U.S. in 2014, 513 Protestant pastors in the U.S. in 2015 / 2016 and 601 Protestant pastors in the U.S. in 2017,” according to the website. The main takeaway from the research sample — titled “Pastors Face Communication Challenges in a Divided Culture” — is that a large majority of Christian leaders agree that discipling Christians around social issues is a critical responsibility for pastors. However, there is less widespread agreement on what exactly this means and how pastors should go about achieving this. 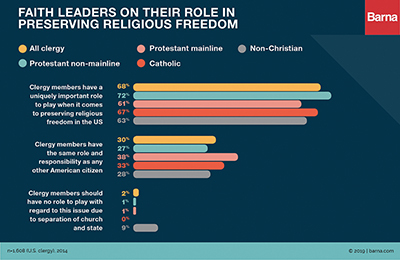 68 percent of all clergy member respondents said they agreed that they have a uniquely important role to play when it comes to preserving religious freedom in the United States. 30 percent said they have the same role and responsibility as any other American citizen, while only 2 percent agreed that they should have no role at all, citing a belief in the separation of church and state. In a survey to Christian pastors, Barna had respondents answer whether each action in a list presented to them were part of their role. 65 percent of pastors said it was a significant part of their role to help their constituents understand the nature of religious freedom in the U.S.
53 percent said it is part of their role to help Christians understand their responsibility to vote on specific issues, and 21 percent said it was part of their job to help Christians understand why they should vote for or against specific candidates. 48 percent said defending the rights of other religious groups is a major part of their role. 90 percent said it is a major part of their role to help Christians have biblical beliefs about specific social issues. More than 90 percent of pastors they believe they have influence with their congregants when it comes to how they think about current issues in society. Of that, 31 percent said they have “a lot” of influence while 60 percent said they have “some” influence. In addition to pastors’ own attitudes on the current social and political climate, researchers also surveyed them about their reactions to the attitudes of their church members. The Barna team found that there were topics about which clergy said they felt limited to speak or pressure to speak. Interestingly, the topics were largely the same for both categories. 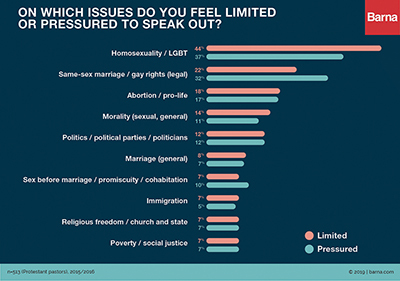 • Half of the respondents said they frequently (11 percent) or occasionally (39 percent) feel limited in their ability to speak out on moral and social issues because people will take offense. • Two in five pastors said they occasionally (34 percent) or frequently (6 percent) feel pressured to speak out on topics they aren’t comfortable discussing. • More than two-thirds of the respondents said these limitations and pressures come from people inside their church. Roxanne Stone, Barna’s editor in chief, said in the article that this research shows the reckoning the Christian community had had to have with what laws are “those of the land” and which are specific to its religious context. She said it’s necessary for pastors to be sure of which issues are a universal good for human flourishing and which involve spiritual transformation or church community. For more information on pastors’ current social views and other aspects of this study, visit https://www.barna.com/research/pastors-speaking-out/. Every year, Outreach Magazine, a Christian publication dedicated to the outreach and evangelism of the church, releases the Outreach 100 report: a list of the year’s 100 fastest-growing churches in the United States. Readers are required to subscribe to the magazine for a copy of the full report, but a complete list of the churches with key details can be viewed for free on the Outreach website at https://outreachmagazine.com/outreach-100-list.html. The fastest-growing church of 2018 was LifePoint Church in Clarksville, Tennessee. It has a weekly attendance of 3,788 people. The third fastest-growing church, Cincinnati-based Crossroads Church, was also the third largest church with a weekly attendance of 35,253 people. Church of the Highlands in Birmingham, Alabama was the largest church of 2018 with a weekly attendance of 43,030 people and was ranked number 59 for growth rate. The 100th largest church of 2018, Compass Christian Church in Colleyville, Texas, was ranked the 76th fastest-growing U.S. church. Interestingly, none of the churches on the 2018 Outreach 100 list have a woman as the senior pastor. “Clear: Egalitarian” is the score given to churches that have made their egalitarian policies clear publicly (typically via a website) and reflects those policies in the current leadership personnel as listed on their websites. “Clear: Non-Egalitarian” is given to churches that clearly communicate non-egalitarian policies such as restricting women from certain positions in the church’s leadership. “Unclear: Egalitarian” is the score for churches with egalitarian policies that are not adequately reflected in the current leadership personnel as listed on their websites. 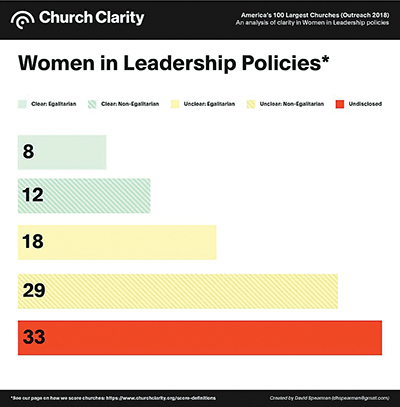 “Unclear: Non-Egalitarian” is the score given to churches with websites that do not clearly communicate their policies that restrict women from any position of leadership. This may be given to churches that do actually include the information, but they are located in “peripheral sections” of the website or in a denomination’s website but not directly linked from the church website’s primary pages. “Undisclosed” is assigned to church websites that do not provide conclusive evidence about their actively enforced policies. There is a sixth score on Church Clarity’s scale, “Verified Clear.” For a church to receive a “VC” score, a representative from the church must respond to a policy survey sent by Church Clarity to every church the organization scores. The survey gives the church an opportunity to confirm its actively enforced policies directly with the Church Clarity team. A “VC” church would not include the status of egalitarian or non-egalitarian because the survey answers are displayed for interested readers on the Church Clarity website. None of the churches on the Outreach 100 list chose to respond to Church Clarity’s survey, according to the website, so the “VC” score is not included for the range listed above. For more information on the definitions of these scores, visit https://www.churchclarity.org/score-definitions#women. 8 of the 20 “Clear” churches met the requirements for egalitarian status from Church Clarity. 29 of the 47 “Unclear” churches received the “Unclear: Non-Egalitarian” score. Church Clarity notes on its website that an “Undisclosed” score does not mean a church doesn’t have a policy regarding women in leadership (“they probably do”); it means the evidence of where it should fall on Church Clarity’s scale is inconclusive and not clearly communicated by the church itself. Whether or not a church chooses to communicate its views in the current social and political climate, there is no escaping the effects that the changes in today’s society are having on the members of the church — and their willingness to communicate their views. In January, Barna released a new study called “Reviving Evangelism” that was commissioned by Alpha USA, an organization dedicated to holding sessions to educate and encourage people to explore the Christian faith. Barna researchers took a closer look at the current cultural climate and people’s responses to it to identify what exactly the aforementioned effects are on practicing Christians. 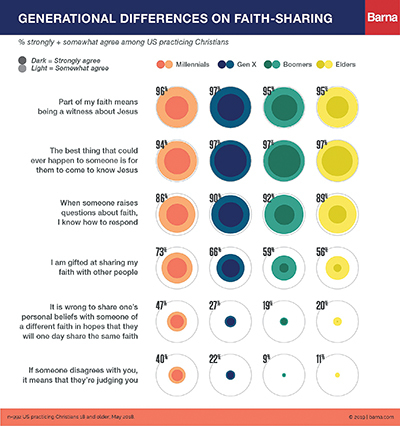 In an article sharing a sample of the research, Barna revealed one of the major findings of the new report: almost half of practicing Christian Millennials surveyed for the report said they believe evangelism is wrong. “Today, a number of factors are curbing many Christians’ enthusiasm for faith-sharing, including the decline of religion in America, a spreading apathy toward spiritual matters and a growing cultural suspicion of people of faith,” according to Barna’s website. The article’s authors note that this description is the backdrop against which Barna is releasing the new report, which is based on research gathered from surveying 992 practicing Christians and 1,001 people categorized as either “lapsed Christians” or non-Christians. The researchers defined practicing Christians as people who identify as Christian, agree strongly that faith is very important in their lives and have attended church within the past month. Lapsed Christians are defined as people who identify as Christian but have not attended church within the past month. According to the data, only 4 percent of lapsed Christians strongly agreed that faith is very important in their lives. Any respondents who identified with a faith other than Christianity or as having no faith at all were classified as non-Christians. Interestingly, Millennial respondents in the survey given to practicing Christians felt the strongest about confidence in their ability to communicate their faith; more than 4 in 5 agreed that they know how to respond when someone raises questions about faith and about three quarters (73 percent) agreed that they are gifted at sharing their faith with other people. The data show that this is higher than any other generational group surveyed for this research with 20 percent agreement from Gen X respondents, 19 percent from Boomers, and 20 percent from Elders, defined as people born before 1946 (age 73 or older). Further data support the conclusion that this tendency is because younger Christians “are generally more personally aware of the cultural temperature around spiritual conversations” than their generational predecessors, according to the article. Among practicing Christians, Millennials reported having an average (media) of four close friends or family members who practice a faith other than Christianity, while Boomers, on average, only reported having one. The authors noted that a cultural resistance to “conversations that highlight people’s differences” makes sharing the gospel today harder than at any time in recent memory. Nearly all lapsed Christian and non-Christian respondents said they have a friend or family member who practices and prioritizes Christianity. Practicing Christian Millennials, lapsed Christians and non-Christians share a priority in the desire to avoid judgment. More than 60 percent of lapsed Christians and non-Christians said they would be open to talking about faith with someone who listens without judgment. 40 percent of the Millennial respondents to the survey given to practicing Christians agreed that if someone disagrees with you in a faith conversation, it means that they are judging you. “The data paint a striking picture of disconnection between Christian ideals of what it means to share faith effectively and the experience of non-Christians — and between non-Christians’ expectations of Christians and Christians’ perceptions of themselves,” according to Barna’s website. When asked for the most desired traits in a “good faith conversation partner,” both practicing Christians and lapsed/non-Christians agreed that listening without judgment, being confident in sharing their own perspective and exhibiting a vibrant faith of their own are important traits to have, though the level of importance each trait has differed between the two groups.